On several occasions lately, I’ve had to transport long objects or gain access to the rear strut mounts in my Toyota Corolla. On most cars, this would have meant to simply pull a lever in the trunk and fold the back seat down but for some reason, Toyota had made this an option on my vehicle (the North American VE model). So in order to be able to take advantage of the full length of the car, I had to remove the rear seat, which is not that difficult and only requires a socket wrench, but still massively inconvenient. 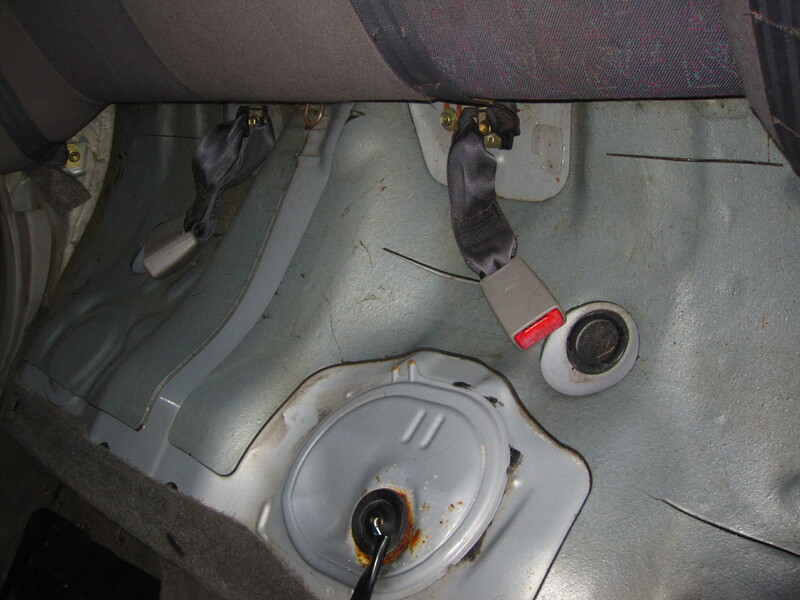 While undoing the seats, I had originally thought of a way to make removal easier and tool-less in the future, but did not decide to make the modification. Until now, with winter at my doorstep, I’m convinced fold-down seats are going to prove themselves quite practical should I want to go skiing. 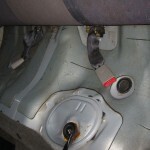 The mod is quite easy and requires no specialized tools or knowledge. The end result is that you will be able to lift the backrest up and lay it flat on top of the bottom cushion, exposing the opening to the trunk . 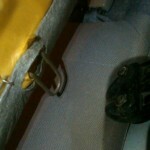 Since the seat belts are bolted to the frame, disturbing the seating should not have any effect on their function. However, you might end-up discarding a part I call the V frame, which could possibly have some structural or security importance, I’ll get to it later. Lastly, I’m not going to post a full disclaimer, this is the internet so you’re following this guide at your own risk. If you or your passengers get hurt because of this modification, nothing can be held responsible but you and your judgement. 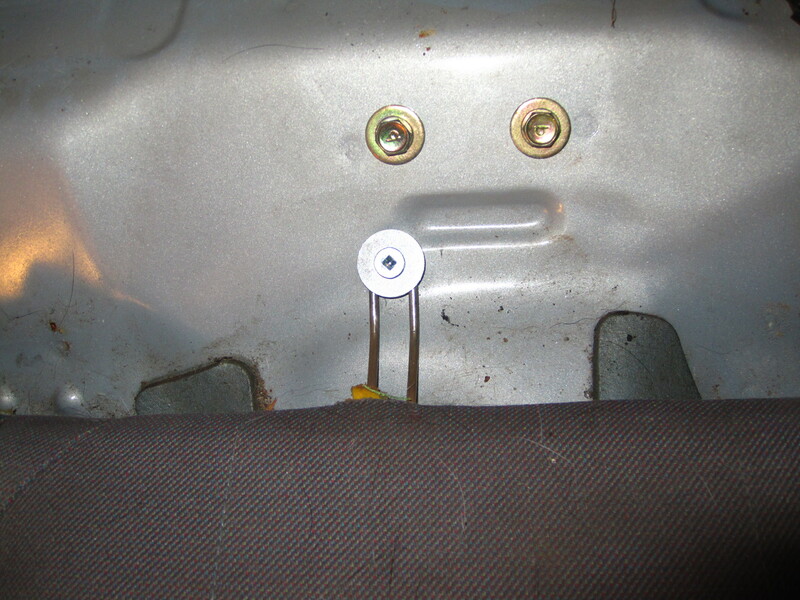 Taking the rear seat apart is nothing really complicated. 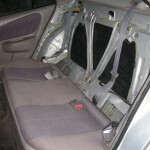 The bottom cushion is held to the frame of the car by only two plastic clips that are approximately lined with the two front seats. You can even feel them by running your hand under the cushion along the outer edge. Pry them out with a sudden pull and they should give. Next, undo the three bolts holding the back cushion to the frame. 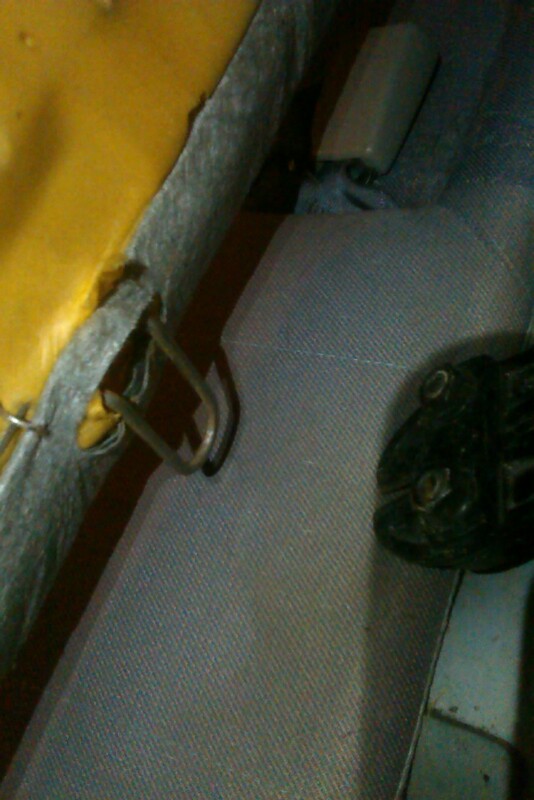 There is a bolt in the middle and two at the extremities close to where the seat belts attach to the frame. Lift the backrest out and set it aside outside the car. 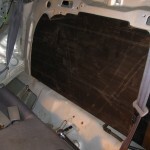 At this point you can re-install the bottom cushion to make working in the car a bit more comfy. 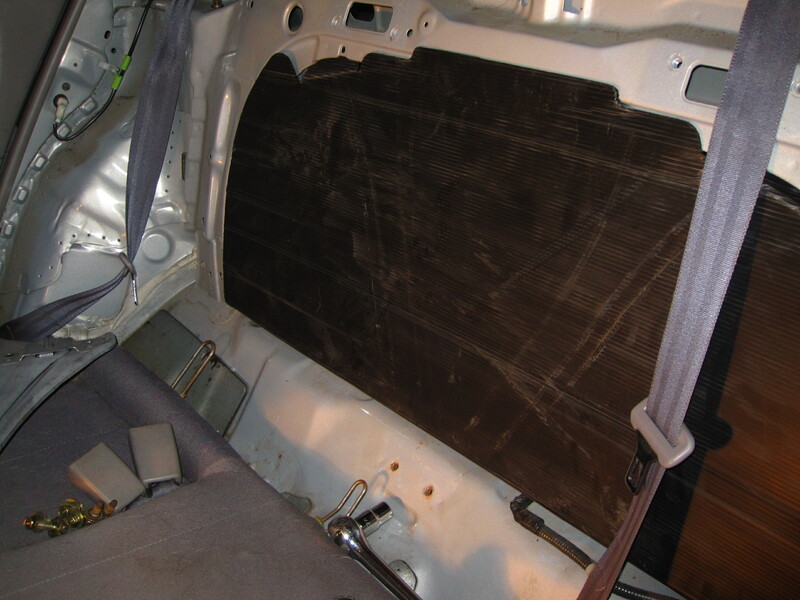 Finally, push out the black plastic cache that separates the trunk and the interior. 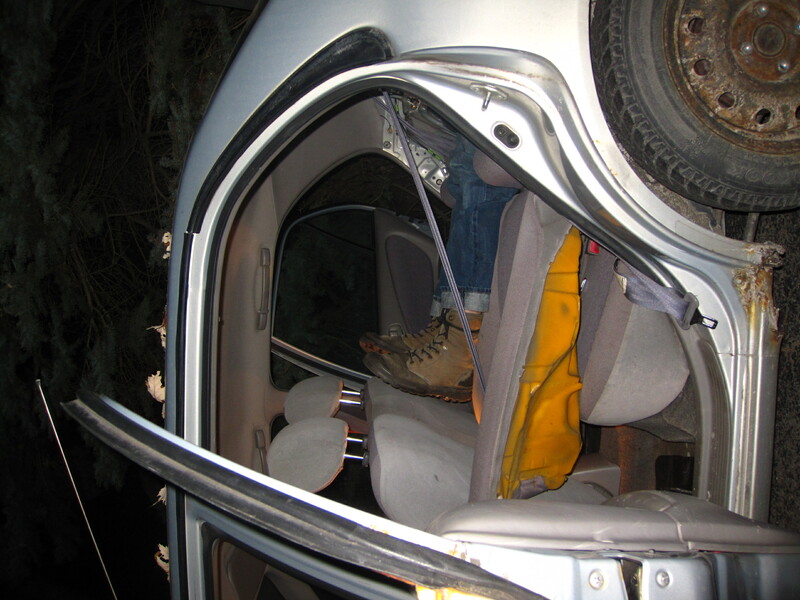 If you just wanted your rear seat out only as a temporary measure, stop here. The car is perfectly drivable in this state. You might notice the road vibrations becoming somewhat louder but that’s entirely normal given the amount of noise insulation you just removed. What I refer to as the V frame is the coincidentally V shaped piece of pressed sheet metal bolted right in the middle of the opening to the trunk. It’s in the way but if it does not bother you you can certainly keep it there. I, for one, decided to remove it because I did not deem it to be critical for the safety or handling of the car. First, Corollas with factory installed fold-down back seats do not have it and I’d be really surprised if their frame was any different than the standard model to account for the added structural integrity. Second, if it’s purpose was to give the body more stiffness, the V would be upside down. It could have a part to play in case of rear collisions, but my theory is that it’s meant to add support to the rear seat. So If you agree with my logic, you can go ahead and remove the six bolts that hold the V frame in place. Last major step is fastening the bottom cushion. It has three metal prongs that would normally slide under the backrest part of the seat, but since it will now become loose, the bottom cushion needs to be attached to the frame. Once you have re-installed the cushion, simply drill holes where the prongs are. 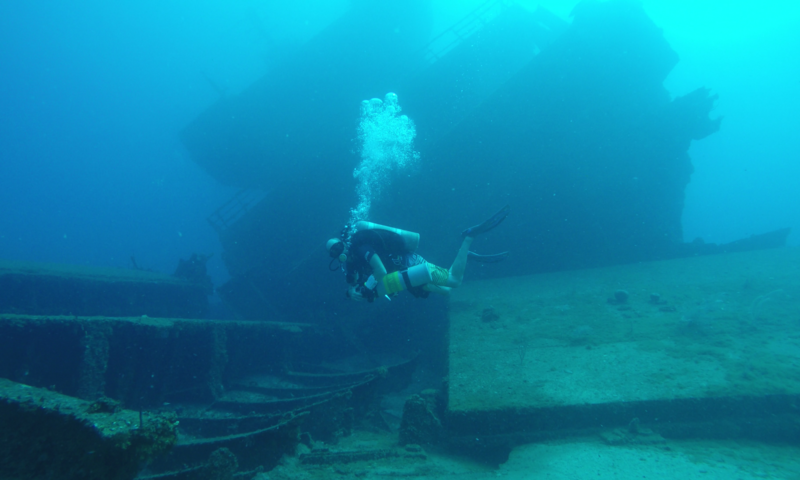 Rest assured, the metal is not very thick and your fuel tank is a safe distance below. Once that is done, use properly sized sheet metal screws and washers and thread them through the holes you just did to hold the cushion down. Of the metal prongs on the bottom of the backrest that used to be screwed to the frame, the middle one get in the way and should preferably be removed. Its not absolutely necessary, but it will make installation easier. This procedure can be accomplished with a bolt cutter or a metal saw. 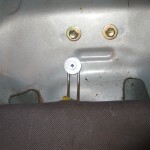 There is another prong right next to the one you just cut that is meant to slide under the seat cushion; leave it in place. 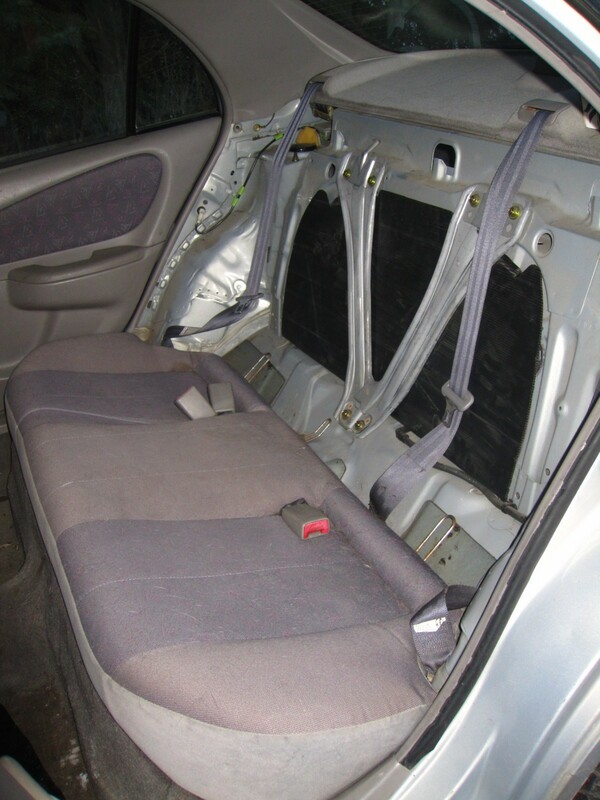 Finally, slide in the backrest, thread the seat belts in their correct position and set it so the metal loops below the headrests pair up with the hooks on the frame. Give it good tap so it sits correctly and you’re done. Nobody should ever notice this little trick but I’m sure its going to prove itself very useful. Done! 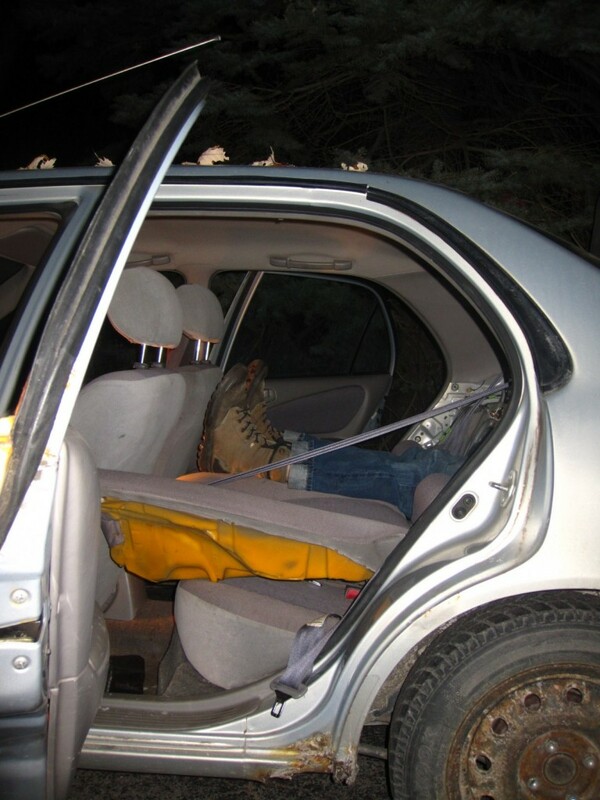 You can now transport dead bodies in your trunk without having to cut them up. Awesome!! exactly the info I was looking for! 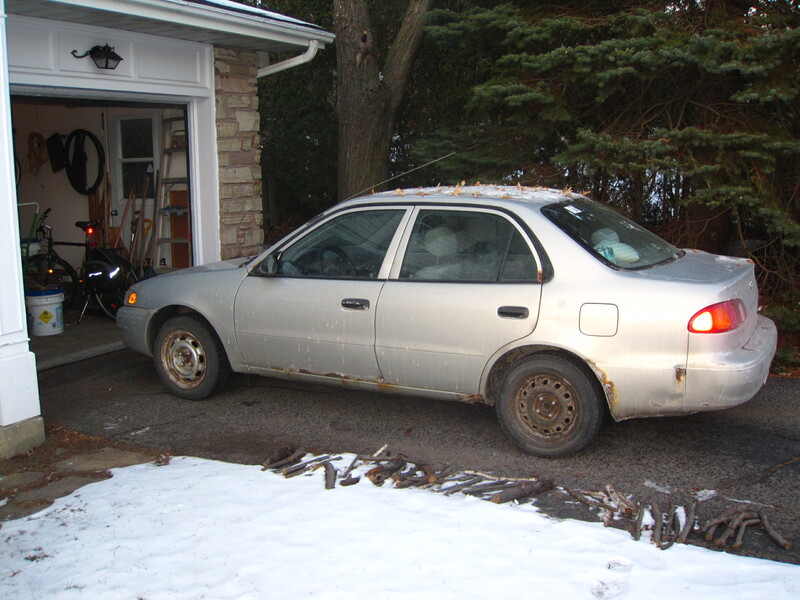 I need to transform my 2001 Prizm into a living/working carpenter’s mobile home/tool shed for myself & my two cats……just until I can make enough to buy the new Winnebago Revel, that is! So…..it might have to last me for a while. My biggest concern is how to sleep in it AND fit everything else in — this is a huuuuge help! Any thoughts on an inexpensive, diy roof rack?? I hope this note finds you well – thank you for sharing your experience – be well! You’re very welcome! As for the roof rack, I can’t think of a solution but to look for one on the classifieds. On you have the rack, maybe you could attach a gallery to make storing things more convenient? 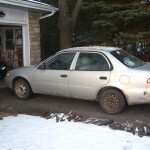 I have a toyota corolla 2001 the trunk is locked (seems broken) and the inside botton doesn’t work. How can I pull down the back seat from inside the car so i can retrieve items in the trunk. If memory serves me right it’s indeed possible to gain access to the trunk by removing the rear seat. Pulling hard on the bottom cushion will unclip it from the frame and give you access to the bolts that hold the backrest.